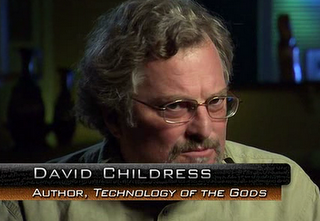 David Childress (formerly David Hatcher Childress) is a self-published author of more than 20 books who appears weekly on H2's documentary series Ancient Aliens. I wrote about Childress in my 2005 book The Cult of Aliens Gods and described him as an ancient astronaut theorist because he had written a book, Extraterrestrial Archaeology (1999) in which he claimed (or rather, in the manner of these “theorists,” suggested) that aliens had left archaeological remains on Mars and the moon. He even included material from H. P. Wilkins arguing that the moon was an alien spaceship, and he quoted so-called “legends” about Martians who came to earth to create the human race. He quoted Zecharia Sitchin for support of his views. However, Childress took exception to this description and attacked me in a 2006 Chicago Reader article (quoted below) because, he claimed, he was not an ancient astronaut theorist. I have discussed his theories here. But a look at Childress's actual record of comments will demonstrate that over the past 25 years, Childress has advocated whatever theory happened to be popular and profitable at any given time. (As Ancient Aliens grew in popularity, his interviews became increasingly alien-focused, for example.) The following quotes show that Mr. Childress (who refers to himself as an "archaeologist" in his YouTube Extraterrestrial Archaeology video but does not have any education in archaeology) has taken two wildly different stances on the existence of extraterrestrial visitors. I will leave it to the reader to decide if Childress genuinely changes his beliefs ever few years, if he holds two contradictory beliefs simultaneously, or if he has ulterior motives for advocating divergent positions. And a special note to David Childress: If you hadn't attacked me by name in print, I probably would never have paid enough attention to you to discover just how dramatically you contradict the information in the books you promote on Ancient Aliens when you speak on Ancient Aliens. “I don’t say” extraterrestrials are responsible for the anomalies of the past but instead that human beings from an advanced civilization were responsible.